Featuring Michael Palmer’s “Letter to St. Petersberg,” Giorgio Agamben’s “The Fire and the Tale,” Alain Badiou on the artist Pierre Soulages, Kevin Simmonds on Leontyne Price’s last performance, Cole Swenson on Andre des Gachons’s Watercolors of weather, Alain Badiou on Black as an Invention of White People, David Lau on the Political Turn in Poetry, Laura Martin on Roland Barthes as a Young Marxist, and Carlos Lara’s translation of Louis Aragon’s classic essay on the beginning of Surrealism. Poetry by César Vallejo, David Buuck, , Jorie Graham, Douglas Piccinnini, Rae Armantrout, Angelo Mao, Anne Boyer, Geoffrey G. O’Brien, Anthony Madrid, Sara Deniz Akant, Shane Book, and Michael Farrell, among others. 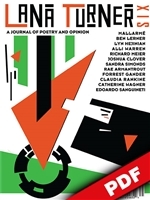 César Vallejo on Art and the Social Sphere, and on Charlie Chaplin, Asad Haider on Baraka and Black Lives Matter, Gopal Balakrishnan on the Meaning of Marxism, Karen Garthe’s Notes on New York, Brian Shields and Emily Wilson and Calvin Bedient on J. M. W. Turner, and Eleni Sikelianos, Cole Swensen, and Calvin Bedient on the Experimental Lyric. 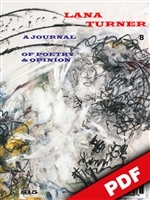 Featured Artists: J. M. W. Turner, Peter Sacks, Hank Saxe. Featuring a long debate between Alain Badiou and Alain Finkielkraut, and Alain Badiou on Theater and Philosophy, Karen Garthe on Sorrentino’s movie The Great Beauty, Emily Wilson on Van Gogh, David Lau on Framing Social Crisis in Films, Edoardo Sanguineti essays on Futurism, on Surrealism, and on the literature of cruelty, Alain Badiou on the Age of the Poets, and Andrew Joron on Ronald Johnson’s ARK, among other essays. Featuring a special section on the Avant-garde in the U.S.A., with essays by Joshua Clover, Kent Johnson, McKenzie Wark, Cathy Park Hong, Joyelle McSweeney, Tyrone Williams, Jed Rasula, Brenda Hillman, and Nick Twemlow, among others. 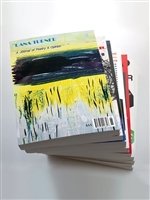 Poems by Juliana Spahr, Aleksandr Skidan, Amelia Rosselli, Joshua Clover, Jasper Bernes, C. D. Wright, Baudelaire, Jorie Graham, Nick Twemlow, ‘Annah Sobelman, Bin Ramke, Mallarmé, Robert Fernandez, Amanda Berenguer, Sawnie Morris, Mei-mei Berssenbrugge, and Aaron Kunin, among many others. Featured artists: Brian Shields and Despina Stokou. 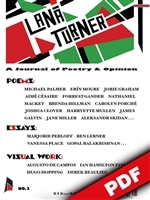 Featuring poetry by Molly Bendall, Jessica O. Marsh, Lyn Hejinian Richard Meier, Catherine Wagner, Lauren Levin, Samuel Amadon, Marjorie Welish, Joshua Clover, James Galvin, Emily Wilson, Mallarmé, Tomaz Salamun, Sandra Simonds, Barbara Claire Freeman, Alli Warren, and Dora Malech, among others. 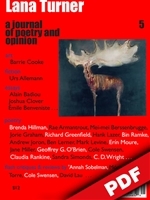 Featuring also Forrest Gander’s series of poems on the dancers Eiko & Koma and extracts from Alexander Vvedensky’s The Grey Notebook; and among other essays, Edoardo Sanguineti on the Avant-Garde, Claudia Rankine on Serena Williams, Calvin Bedient on Brenda Hillman, and David Lau on Committed Poetry. Featuring Emile Benveniste’s Notes on Baudelaire, Lindsay Turner on Béla Tarr’s movie Turin Horse, Alain Badiou on Godard’s film Passion, Joshua Clover on Epic and the World-system, David Lau on Cathy Hong and Will Alexander, Jason E. Smith on Badiou and Riots, Nathan Brown on Badiou and Communist Theory, among other prose essays. Plus Urs Allemann’s short story “Aeroaquatia,” and poetry by Rae Armantrout, C. D. Wright, Jorie Graham, Erín Moure, Ben Lerner, Jane Miller, Richard Greenfield, Claudia Rankine, Brenda Hillman, Geoffrey G. O’Brien, Jacqueline Frost, Joshua Clover, Cole Swensen, and many others. Many brief reviews. 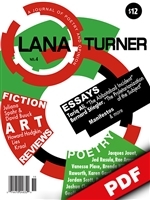 Poems by Jed Rasula, Vanessa Place, Tom Raworth, Jeanine Webb, Joshua Clover, Brenda Hillman, Elizabeth Robinson, William Fuller, Jeffrey Yang, Pablo de Rokha, Rae Armantrout, Paul Hoover, Sandra Simonds, Angela Carr, Shane Book, Douglas Piccinnini, Karen Garthe, Anthony Madrid, and many others. 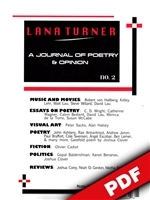 Includes David Lau on Poetry as Critique, Vanessa Place on Radically Evil Poetry, Cal Bedient on Modern Art and Equality, Ben Lerner on the artist Simon Hantai, Marjorie Perloff on Merce Cunningham, and Gopal Balakrishnan on Badiou's The Century. Hugo Hopping is the featured artist. Poems by Forrest Gander, Jorie Graham, Michael Palmer, Nathaniel Mackey, Carolyn Forche, Jane Miller, and many others. Featuring poetry by John Ashbery, Cyrus Console, Ángel Escobar, Shane Book, Ben Lerner, Joshua Clover, Geoffrey G. O’Brien, ‘Annah Sobelman, Rusty Morrison, Rae Armantrout, Cole Swensen, and Andrew Joron, among others. The essays include C. D. Wright on Poetry and Wall-mart, Catherine Wagner on New Sonnet Collections, Calvin Bedient on Metasexual Poetry, Matt Lau on Godard, Robert von Hallberg on Film Noir, Steve Willard on Fergie, and Aaron Benanav on Gopal Balakrishnan’s Agonistics. Plus Gopal Balakrishnan and Joshua Clover in conversation.